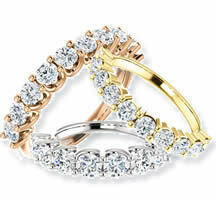 Our selection of Anniversary and Eternity Bands featured by Style, Design and Diamond Weight. 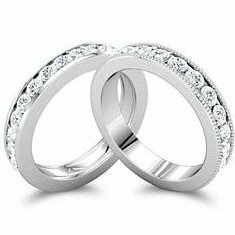 We offer most of the favorite anniversary and eternity bands with multiple options as well as unique Perfect Fit Eternal-Love line. Choose from a variety of metals (white, yellow or rose gold, palladium and platinum) as well as different diamond total weight. If we don't have what you need, we can make it. Anniversary Bands and Eternity Rings. Our diamond anniversary rings are manufactured using the finest quality of precious metals, gemstones and diamonds. 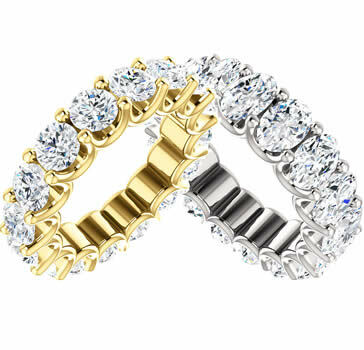 WeddingBands.com manufactures the anniversary and eternity bands with gold, platinum, palladium and/or combination of these metals. 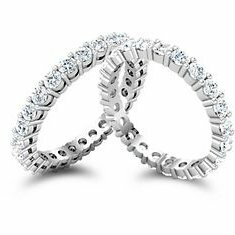 The platinum anniversary rings and eternity bands are manufactured with 95% platinum. The diamonds used in our anniversary rings are all calibrated to give the maximum brilliancy and fire. WeddingBands displays hundreds of women's anniversary bands and eternity bands of exceptional originality and spirit. From the Romeo-Juliet Verona Lace line to simple diamond anniversary and eternity rings all unique designer collections. Most of the rings are manufactured using the latest CNC machining technology. Using the technology in the service of human imagination is what created our anniversary and eternity rings. Verona Lace rings reflect the historical, social and cultural art and imagination. They reflect the Renaissance art and detail work. The Royal Duet Anniversary Bands and Eternity Rings succeed the impossible in manufacturing of wedding bands using state of art CNC technology and AutoCAD designs. They are simply the crowning achievement of the master jeweler's art. You can customize your anniversary ring and eternity ring simply by emailing us your sketches to CustomerService@WeddingBands.com or calling us at (888) 422-4333.